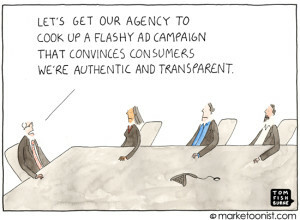 “Authenticity” is the new buzz-word in marketing circles these days. As it should be. But what does it mean and how do you achieve it with your brand? It’s definition is easy understand – not being fake, being genuine or real. Yet businesses struggle with portraying their authenticity every day. It’s not something you can conjure in a marketing meeting. It’s not something that is contrived at the highest levels of management. The key to having an authentic voice is to first know what who you are as a business. You’ll find the answer from only one source – your customers. Their perceptions are the only ones that really matter. Why do they choose to do business with you? What makes you special in their eyes? Only by asking them can you truly uncover the heart of what your business is really about. Sometimes this reality can be tough to swallow if you let ego get in the way. Often, your reasons for being in business may be different from the reason your customers do business with you. It’s this latter truth you must seek in order to have an authentic brand voice. With this truth in hand, having an authentic brand voice is as easy as telling your customer’s stories. The more creatively the better. But never let creativity get in the way of your authenticity. Consumers have developed a pretty good nose for what’s real and what’s not. That’s why it pays to be authentic.